Whether you just like to jump right into a pair of cosy pyjamas as soon as you cross your front door, or perhaps you save a special pair for that after-bath / fresh bed sheets glow or you find your own personal situation means having to adapt clothing wise, to wearing pyjamas or lounge wear more frequently because of health reasons. Whatever the reason, pyjamas and lounge wear play an important part in our lives, they provide comfort. They are the uniform of self care and are worth investing in. As I mentioned earlier, in my own experience, two stores stand out in regards to good quality and budget friendly options when it comes to pyjamas and lounge wear. In fact, some of the pieces I'm about to show you I have already bought myself and wear frequently so I can offer some insider knowledge here! All of the above pictured are from F&F at Tesco, somewhere I've shopped for pyjamas a lot in recent years. 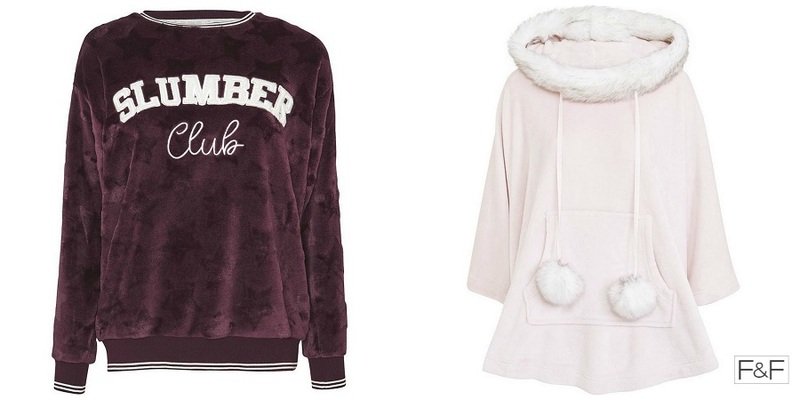 Out of my picks here I can say with certainty that the Dream Team Pyjamas, the Waterfall Dressing Gown and the Pink Faux Fur Trim Fleece Poncho are heaven sent in terms of cosiness. Going forward I feel I will be complete only when I get my hands on those velvet rabbit slippers. Much as though I do shop at Tesco and tend to pick pyjamas and lounge wear up there every now and again when I'm in-store, I have found that it's George at Asda who have the perfect pyjamas for those of us who suffer with any chronic pain or illness. Let me explain... Through the last few years I've had frequent procedures at hospitals, I have conditions that mean my stomach swells and becomes painful, as well as my abdominal area, clothes can be tricky to manage when you can't even wear a bra most days! Don't mistake this for a pity party, it's anything but! My point is, I finally found the perfect pyjamas that don't pinch, that are comfortably loose, that are of a quality that will last through a year of repeated washing and that look good! Without a shadow of a doubt, George at Asda have nailed the perfect fit of pyjama bottoms and the best thing is? These come in at just £6 and are usually included in their mix and match offer. The waistband is elasticated and there is a nice amount of stretch to these without running the risk of loss of shape. The shape is wide legged enough so you don't feel as though you are wearing grubby pyjamas, in fact you would almost believe these are much more high end than they are. I always team them with some sort of swing vest top and that comes down to comfort. I need a loose fit in my lounge wear and adore the range of these that George at Asda has all year round. Looking out for something in a swing style with lace edging can help perk up your mood as well and if that doesn't work then pom pom slippers are bound to. I can confidently say that this set helps reduce night sweats due to hot flushes as well. What more could you ask for!? 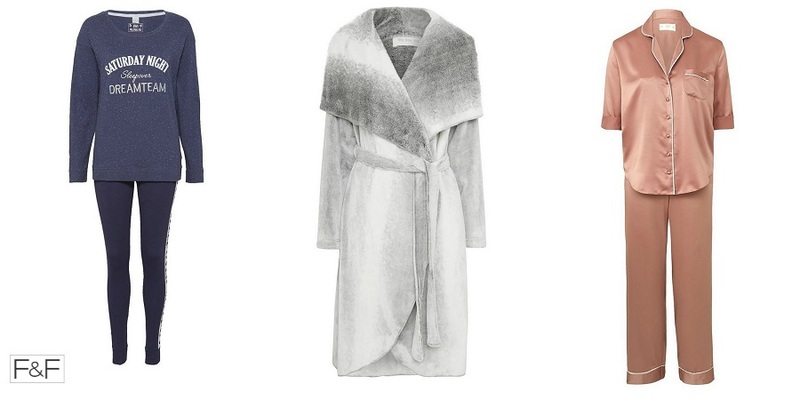 Shopping for lounge wear and pyjamas can be a minefield at the best of times but when you have specific needs it can make it just that little bit more difficult to navigate. Hopefully this post will help someone who, like me a few years ago, couldn't find pyjamas that made them feel good and accommodated their needs. 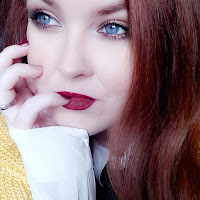 I wholly suggest investing in some new pyjamas, changing those bed sheets and having a nice long soak in the bath this weekend - it sounds like the most basic of self care actions but trust me when I say it can take you from feeling like a swamp monster to a glam, put together, lounge wear wearing stylista in no time at all!